The bond between a grandparent and grandchild is such a special connection, don’t you think? Without the pressure of the day-to-day parenting, it can be such a breath of fresh air to open yourself up to a world of play and discovery as you see the world through your grandchild’s (magical!) eyes. And you serve a unique role in the family lineage–a wise adviser, family historian and a strong, respected family member to lean on–it’s no wonder they call this time your golden years! 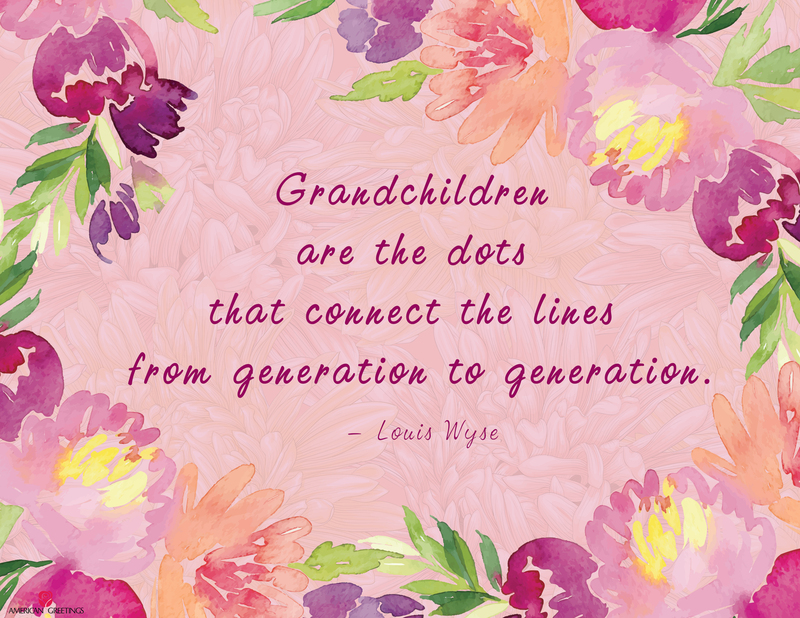 Grandparents Day is coming up on Sunday, September 10th and to celebrate, we created this free printable Grandparents Day quote just for you! This free printable artwork is perfect to display in your home or office or share on your social networks. Download and print this free Grandparents Day quote HERE to help celebrate the important bond between grandparent and grandchild! Looking for another fun way to celebrate Grandparents Day? Get a great list of questions with tips for Connecting with Grandparents to kick off a meaningful talk! 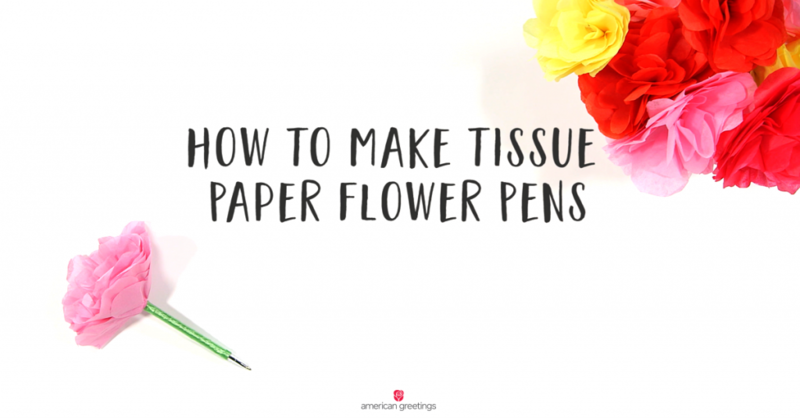 Tissue paper flower pens are a fun, inexpensive and easy way to make someone a gift from the heart. For less than $1.00 per pen, you can create a festive keepsake that’s sure to make them smile—without breaking your wallet. And the best news is, you don’t have to be super crafty to make one! Lay a single piece of tissue paper flat and smooth it out. 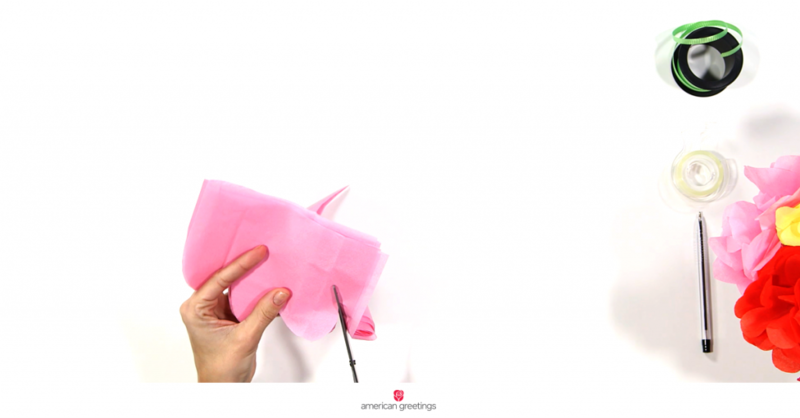 Fold it in half four times, smoothing it out each time to avoid wrinkles. Take your stack of petal-clouds and restack them on top of each other, flipping some of them over and rotating them around so that they’re in an uneven stack, not perfectly one-on-top of each other. Use the tip of your pen and press down on your stack of petals. 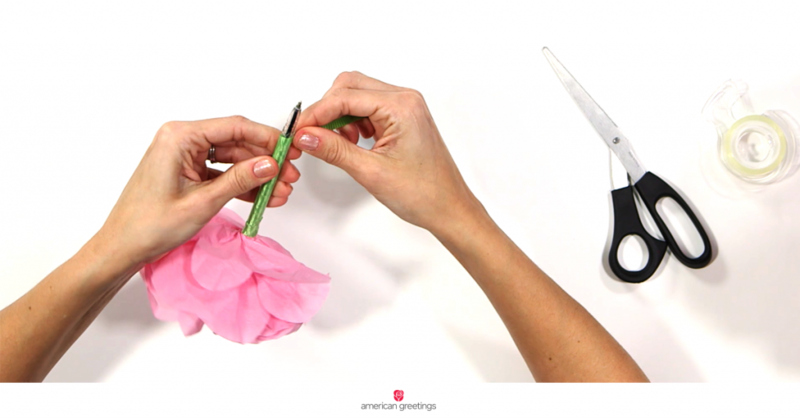 Carefully pull the petals up 2-3 layers at a time onto the handle of the pen. 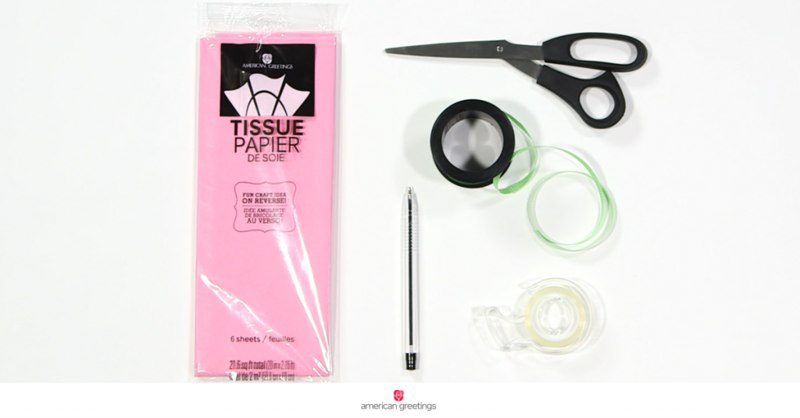 Once all of the tissue paper is pulled onto the pen, wrap the flat end of the pen in double-sided tape. Pull up a single piece of tissue paper and gently press it onto the tape from several sides. Gently squeeze the tissue paper to pull it all close together. Now you pull all of your petals a few at a time towards the end of the pen. 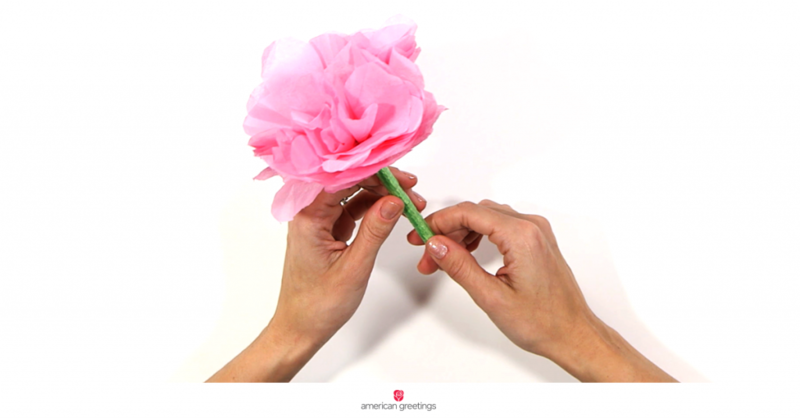 Gently pull your petals through your thumb and index finger to smooth them out and bring the flower together. 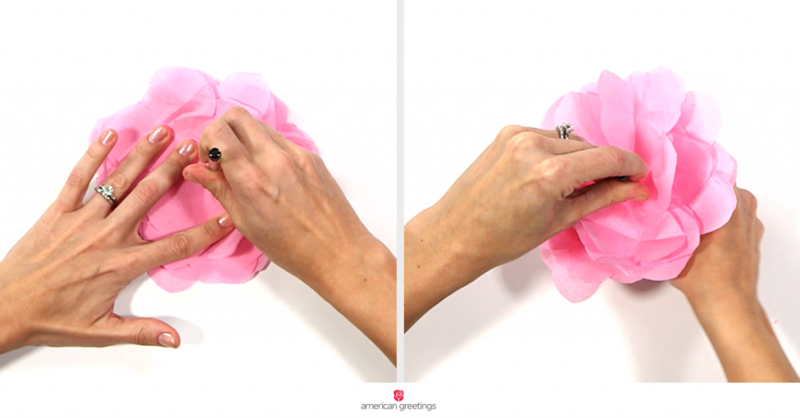 Holding the flower between your thumb and index finger, wrap the very base of the flower in double-sided tape. Apply double-sided tape length-wise down both sides of the pen and wrap the base of it as well. 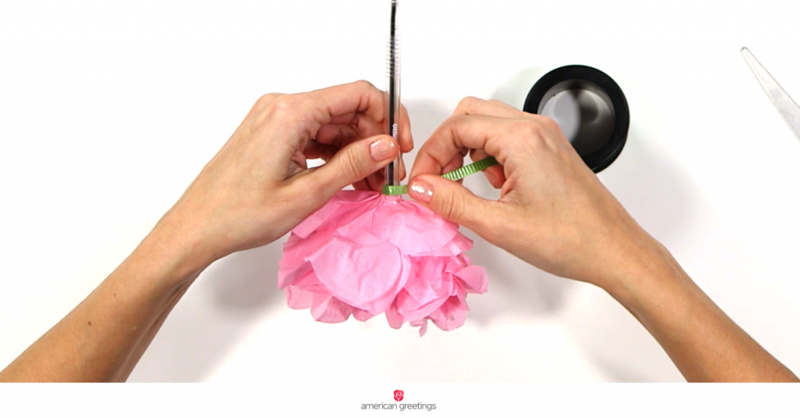 Then starting at the base of the flower, wrap the pen in the green curling ribbon. Move slowly and overlap it so that the pen is completely wrapped in ribbon. When you reach the base of the pen, cut of the excess curling ribbon. If the ribbon feels loose at the tip, you can tuck another piece of double-sided tape under the tail end of the ribbon for extra security. And there you have it–an adorable tissue paper pen, perfect for celebrating any occasion! If you want to make a dozen, it will take about two packages of tissue paper and about a roll and a half of curling ribbon, keeping the total cost of this project under $1/pen. 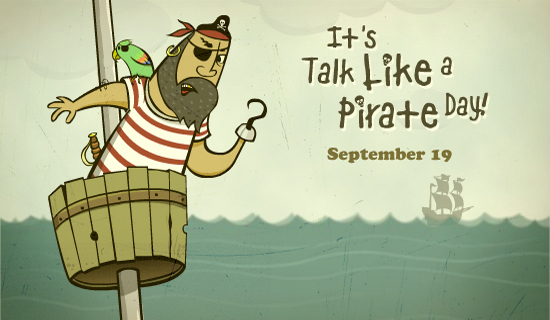 Talk Like A Pirate Day be celebrated on September 19, ‘n ye ‘would-be’ buccaneers best learn t’speak th’ lingo. If ye reckon that jus’ sayin’ “arrr” at the’ end o’ every sentence will fill yer sails and float yer ship–recon again, landlubber! It’ll jus’ get ye tossed o’erboard! Ye be needin’ t’ be rigged up wit a Pirate name—get yer’s here! Change yer Facbookin’ language t’ “Pirate”, ye’ landlubbers! Send all ya scallywags an “Arr!” with a pirate ecard. Wearin’ a eye patch will make ye’ more feared than th’ black spot. A pirate without a crew is bereft indeed! Assemble yer mates and get loaded to the gunwalls with pirates grogg of rum, pineapple juice, coconut juice, or what’ere ye’ scallywags can muster. Talk wi’ yer hands as much as ye tongue, as pirates be loud and animated. Just be careful wavin’ that hook around… ye could put n’ eye out! 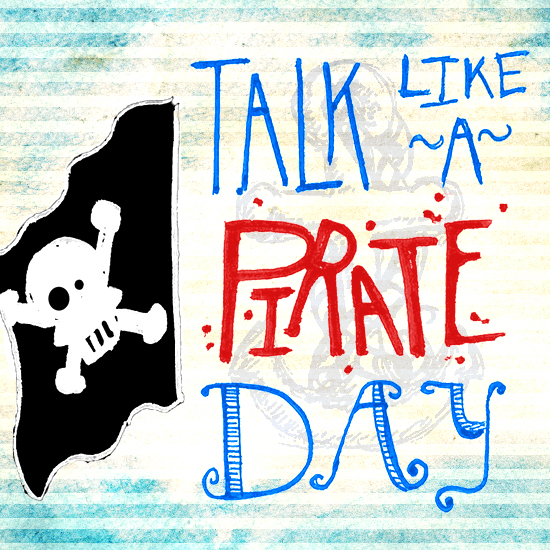 Now get to celebratin’ talk like a pirate day! ARRR!